Graded PSA 9.5, the finest known Babe Ruth (single-signed) autographed baseball was purchased for a record price of $150,000. Photo courtesy of PSA. A new record price for an autographed Babe Ruth baseball has been set less than a year after it smashed previous records. The finest known Ruth-signed ball, graded 9.5 out of 10 by Professional Sports Authenticator (PSA), has privately traded hands between a Southeastern U.S. seller and an anonymous East coast buyer for $150,000, according to PSA. "This incredible baseball first set a record in November 2004 when it was purchased for the then-astounding price of $115,000. Underscoring the growing strength of the market for third-party authenticated and graded sports collectibles, it now has been sold for a new record, $150,000, in a deal brokered by Memory Lane, Inc. of Tustin, California," said Joe Orlando, PSA President. 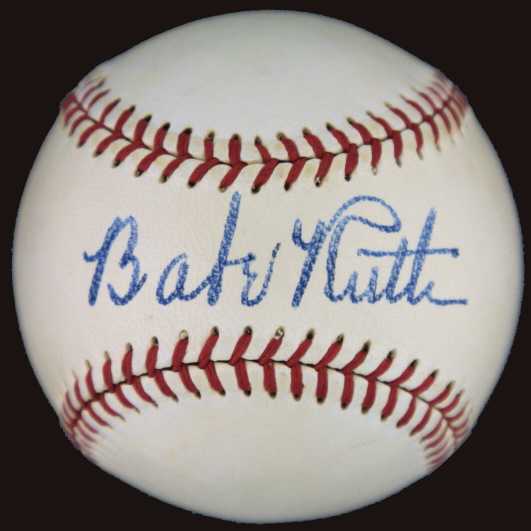 According to Orlando, the market for graded autographs has significantly increased, and this particular ball is widely regarded by most hobby experts to be the finest single-signature Ruth ball known. "The eye appeal is extraordinary, with Ruth's big, bold signature astonishingly vivid in blue ink. The overall grade for the signature and the condition of the ball is 9.5, and that�s still the highest PSA grade to date for a Ruth-signed baseball," said Orlando. Collector Kevin Coleman of Florida, who sold the ball through Memory Lane, said: "The PSA 9.5 grade confirmed this ball as the best of the best. When I purchased the ball last year, it was the PSA certification that gave me confidence as a buyer. Now, as the seller, the same certification enabled me to sell with ease." Roger Cameron, Memory Lane's Director of Marketing, said: "We are ecstatic about the sale. We've handled many landmark deals and our clients are among the 'who�s who' of sports memorabilia collecting. There were numerous clients who wanted to purchase this ball, and collectors would not have offered that kind of money without the authenticity and grading by PSA." PSA of Newport Beach, California, the world's largest sports memorabilia authentication company, is a division of Collectors Universe, Inc. (NASDAQ: CLCT). For additional information, contact PSA at P.O. Box 6180, Newport Beach, CA 92658. Phone: (800) 325-1121. Web: www.PSAcard.com E-mail: info@PSAcard.com.